The RapidClean P2P Ultraslim Interleaved Towel is engineered using new innovative â€˜point to pointâ€™ (P2P) technology that enables us to bind two plies of towel together and create a series of small air pockets within each sheet. These small air pockets allow the towel to absorb at phenomenal rates whilst offering superior softness to most towels on the market. This premium quality towel is perfectly suited for upscale environments and ideal for light duty wiper applications. 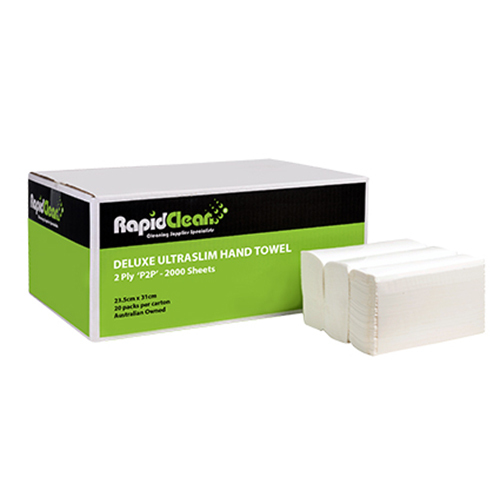 By coupling the absorbency of P2P with a hygienic single-sheet dispensing system, RapidClean P2P Ultraslim is able to guarantee less paper usage and thus significantly reduce costs. Designed to fit all ultraslim dispensers on the market.